Girls Rise Up for WriteGirl’s Season 17 Finale! Spotlights shining, crowd hushed, and girls clutching their journals, the Writers Guild Theater was teeming with proud family, friends and mentors, as 60 WriteGirl teens had the chance to take to the stage. Nearly 300 people were in attendance at WriteGirl’s 17th annual Season-End Celebration on Saturday, June 23, 2018. This year’s theme, Girls Rise Up, highlighted the continuous accomplishments and strength of WriteGirl’s teens through creative writing. 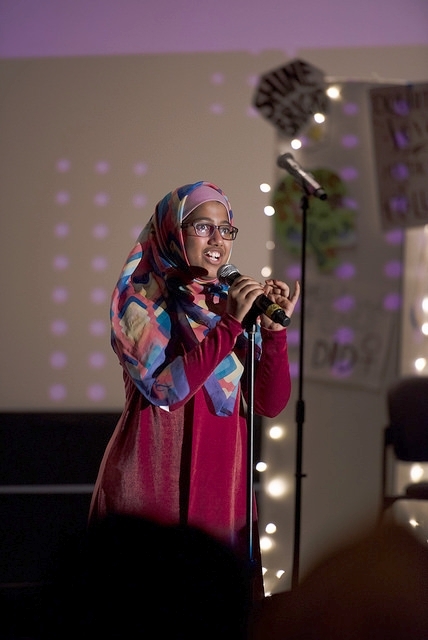 The stage was adorned with hand-drawn posters featuring words of empowerment, resembling those often seen at marches, and sharing the importance of strength through unity. Row after row, the teens lined the stage and shared poems, songs, narratives, excerpts from their novels and powerful writing tips. “Changing the world is always on my mind,” 17-year-old Autumn shared. “You can’t be silent on paper,” WriteGirl mentee Samantha said. WriteGirl Executive Director Keren Taylor and Curriculum Director Kirsten Giles helped to reinforce feelings of female empowerment by praising how unique and moving the girls’ pieces were. The duo also introduced six special guest actors, including Robin Weigert, Ashley Clements, Alison Becker, Anne Judson-Yager, Cristela Alonzo, and Donielle Artese. These guest speakers helped bring the girls’ words to life by performing written pieces on stage. WriteGirl Associate Director Allison Deegan and Bold Futures Associate Leslie Awender, shared that 100% of WriteGirl mentees graduate high school and attend college. This enormous feat is made possible through volunteers who mentor and guide WriteGirl juniors and seniors through their college and scholarship application process. Four WriteGirl alumnae shared their experience with and gratitude toward the program, including Janel, a recipient of Posse Scholarship on behalf of WriteGirl’s nomination. Thanks to our sponsors Sharky’s Woodfired Mexican Grill and Sprinkles Cupcakes for helping make the celebration a big success!